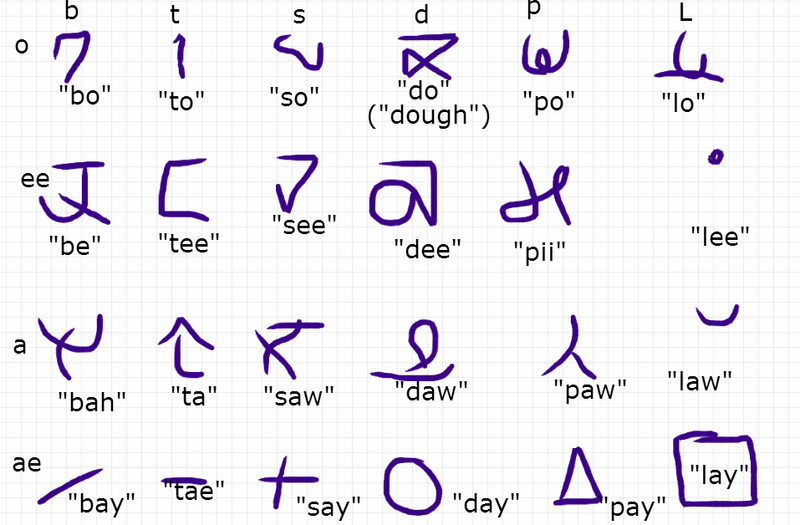 I mentioned in my last "Creating a fictional language" post that I enjoy creating symbols when coming up with words. But there are a few ways to do that. There are two essential ways to create an alphabet: Start with a set of sounds, or start with a set of "letters." If you start with your sets of sounds, you simply draw a character for each sound. If you have a system that combines consonant and verb sounds, it may help to arrange your sounds in a chart. Then draw a character that will stand for each sound. You can also start with the symbols and assign them sounds. This works especially well if you have an alphabet-style language, which combines letters into words. Combine characters to make words: "kosnowch"; "groy"
In each case, you'll want to decide if the sounds are analogous to English, especially verb sounds--do you have a single "o" letter for both "for" and "both"? Is "aw" different from "apple" or "apricot"? If you have multiple forms of a vowel, you may consider having different symbols for each pronunciation. You may also have letters that "interrupt" or "add on" to sounds, especially if you have verb-consonant characters. "traton" would be "ta" in a box + "to" + "-n"
In the example above, adding a box around a triangle would be pronounced "pray"; a box around vertical line would be "tro." Meanwhile, a dot above a triangle would be "pays" and above a horizontal line would be "tays" (like "taze"). I usually make modification sounds their own column. If you've waited this long to create your language, you probably already have a good idea what major sounds your language uses. I typically also try to keep each letter to 1-4 strokes when writing it, with most being simple--after all, an inconvenient language takes longer to write. Assigning a scribble to each letter doesn't take terribly long. It's memorizing the combinations that gets hard. Keeping each letter distinct can be tricky, and you may end up with a system like a vertical line for all "ah" sounds with different scribble variations denoting which consonant. And of course, a 6-consonant language is pretty hard to work with. 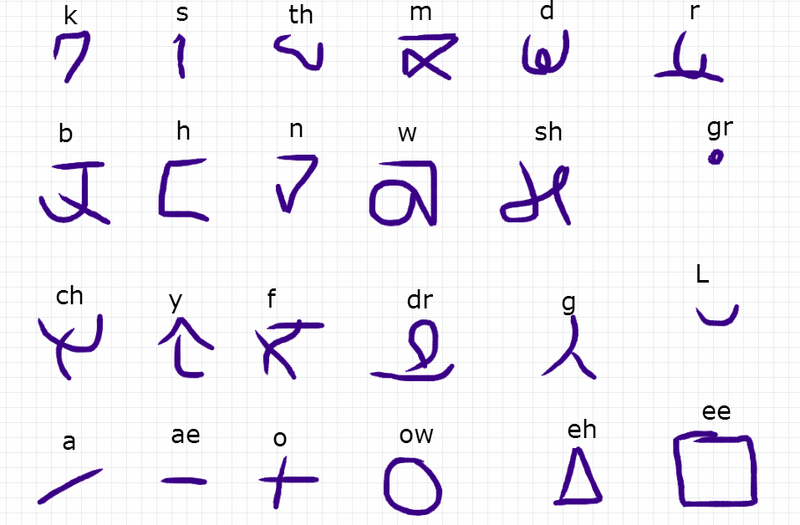 I've found that single-letter alphabets are shorter to work with, while consonant-vowel combos take more characters to make a complete alphabet. The more sounds that go into a single character, the more characters you'll need to express your entire language. After you've put together your alphabet, consider if you want any characters to have special rules ("paw" never goes beside "tae"; "pled" never gets an "-n" added to it; "bay" when combined with "-ed" sounds like "blade"; etc). If you've started with a language and have a list of rules, add these rules to your list; they're just as important. As a final step, think about punctuation. How do you denote sentence stops and sentence beginnings? Or do you? I find it a lot easier to have the basics period and comma, at the very least. Or if not a period, then a sign that new sentence is beginning.